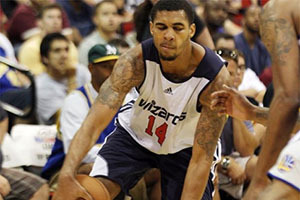 The Washington Wizards player, Glen Rice Jnr has been named the MVP for the Samsung NBA Summer League of 2014. The player was the unanimous selection, making sure that he was the standout player of the evening. In total, 10 players have been selected as the key players from the summer event, with the Samsung ALL-NBA Summer League First and Second teams being chosen by key players in the media. The Championship game between the Houston Rockets and the Sacramento Kings is still to be played but there has been a great deal of excitement and interest in the event. 24 teams have played out over 60 games across 11 days and it only too Rice Jnr six games to prove himself to the MVP of the summer event. He was instrumental in the Wizards getting to the semi-final stage. The team had a 5-1 record at the summer event and he managed to pick up an average of 25 points, alongside 2.5 steals and 7.8 rebounds, which is not bad going at all. The Summer League clearly isn’t seen in the same standard or light as the main NBA season but it is a tremendous was for some players to develop skills and confidence. There is also an opportunity for some players to lay down a marker for the upcoming season. Whether there is a rookie looking to break through to the main team or there is someone with a point to provide ahead of a new campaign, the summer event is perfect for many players and teams. The fact that the Wizards had such a good campaign is highlighted by the fact that Rice Jnr is joined in the First Team by his team-mate Otto Porter. The Chicago Bulls also served up two players to the First Team, with Doug McDermott and Tony Snell being included. The First Team was rounded by Donatas Motiejunas, who hails from the Houston Rockets. The Second Team is made up of TJ Warren, from the Phoenix Suns, Russ Smith, from the New Orleans Pelicans, Jordan McRae from the Philadelphia 76ers, Tim Hardaway Jnr from the New York Knicks and Rudy Gobert from the Utah Jazz. This is the second year that the Summer League has taken on a more serious tournament style, meaning that there is a greater level of interest and focus in what is on offer. The Golden State Warriors were the team that triumphed last year and there is a lot of excitement building up to the Championship game taking place on the 21st of July. While it is good to recharge the batteries during the summer, many basketball fans enjoy the opportunity to enjoy some big games and see some new or returning players in action. With the 2014 FIBA World Cup still more than a month away and the return of the NBA Season even further away, this is exactly the sort of event that will sate the demand of basketball lovers and fans.